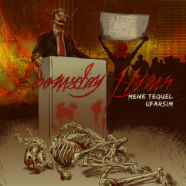 Formed in Parana, Brazil, Doomsday Hymn successfully merges elements from a plethora of metal influences to bring us their debut album, Mene Tequel Ufarsim. After flip-flopping members more than a few times, they solidified a thriving dynamic in 2014, and were successful with their launch of their first self-titled EP. A true blend of styles of metals, Mene Tequel Ufarsim continuously keeps tracks interesting with catchy riffs and insane percussion. A genre of metal can easily be identified in at least one song, and nearly all tracks contain more than one style. The choruses are melodic yet still brutal, emphasized by the aggressive vocals. Speaking of vocals, they’re all in Portuguese. I wish I could tell you about the mood the lyrics create, but I have no idea what they are. That being said, I’m not usually able to pick up many real words in metal anyway, and the intention behind the vocals is just as intense as any American album. Once you get past the culture-shock of the language, it’s actually an exquisitely crafted album. And if you really want to understand the lyrics of your music, why the hell are you listening to metal? I’m actually able to hear some Latin influence within the album, but you’d hardly hear this album coming from a mariachi band. Something about the way the percussion is used to really hit the intensity of the other instrumentals home is really mastered within Mene Tequel Ufarsim. If you’re really looking to branch out with your taste in music, Doomsday Hymm’s Mene Tequel Ufarsim would certainly add a great conversation piece to your library. The album serves as a great example of how, despite huge barriers like distance and language, the urge to create music with face-melting brutality is found in every culture.